I make a lot if soups around these parts, especially in the cooler months. Soups are a great way to get your daily intake of vegetables and nutrients and blended soups are particular great for hiding vegetables from those veg phobes. I’ve personally loved vegetables my whole life and there are few I don’t enjoy eating, but I know that’s not the case for many people, Hubby being a case in point. Until relatively recently, he was hesitant to eat many vegetable varieties, so I got into the habit of blending soups since he seemed to enjoy the soup that way regardless of the vegetable I used. That said, he has come a long way and his palette has grown to appreciate more plants. 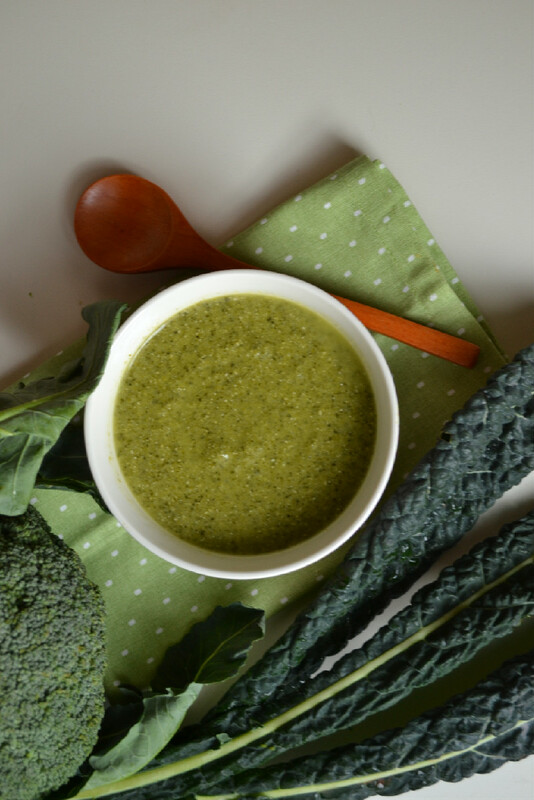 Broccoli and Kale, two of my favourite vegetables have grown on Hubby and this Creamy Broccoli and Kale Soup has become part of our weekly repertoire. It’s so easy and quick to prepare after a long day of work and really hits the spot. 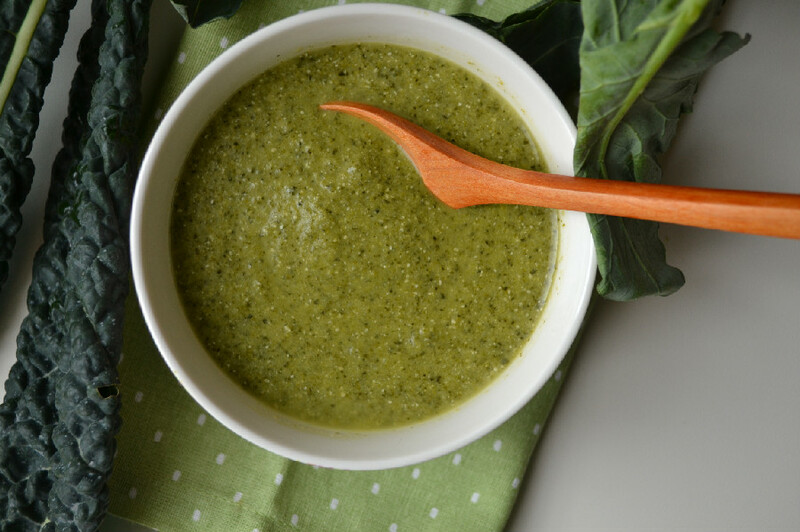 This is the ultimate nutrient dense soup. It’s packed with the goodness of broccoli, kale, almonds and sunflower seeds, giving you a mega dose of cruciferous vegetables and leafy greens. Both broccoli and kale have trace amounts of practically every vitamin and mineral and both are particularly rich in Vitamins A, K, and C as well as calcium and iron. Broccoli is also a particulary good source of folate and many of the group B complex vitamins. I use Herbamare to season it up, which is a seasoning mixture made of sea salt, herbs, vegetables and kelp. It has great flavour so you don’t have to use additional salt which is fantastic. If you can’t find it, feel free to use your favourite mixed herb seasoning, sea salt and ground black pepper. Small knob of coconut oil, water or broth to sautée the onions. At this point, the soup will be a bit on the watery side, and two shades of green, medium green with flecks of dark green. Season to taste with your favourite dried herb mixture, sea salt and ground black pepper or Herbamare. Simmer for 10 minutes before serving. Glad to hear it. Hope he enjoys it as much as my hubby does.